☑ Breathable Neoprene Material: This ankle support is made of breathable neoprene material, perforated breathable fabric is conducive to perspiration, increases blood circulation and provides soothing warmth. ☑ Adjustable Size: Our ankle brace is adjustable design has better compatibility, fits for the ankle is 18 – 32 cm, you can save the velcro to fit your size, also suitable for men, women, girls, boys, children. ☑ Ergonomic Design: This ankle support bandage has an open heel and without edge design, easy to thermolysis and ventilated, ensure that you wear more comfortable, convenient for your daily use. ☑ Stable Protection:Cross-type design pressure belt, to improve the stability of lateral movement of the ankle, avoid strenuous exercise caused ankle sprain, improve the ankle strength. 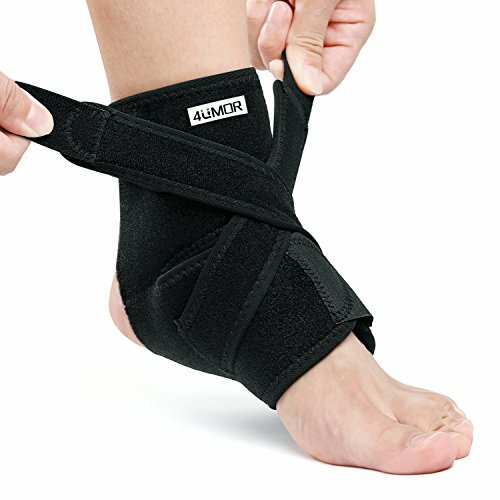 ☑ Comfortable and Mutil-Used : This ankle brace can be worn for the whole day, protect your foot health. You can also take a little effort when wearing this ankle support – ideal for walking, basketball, hiking, football, jogging.